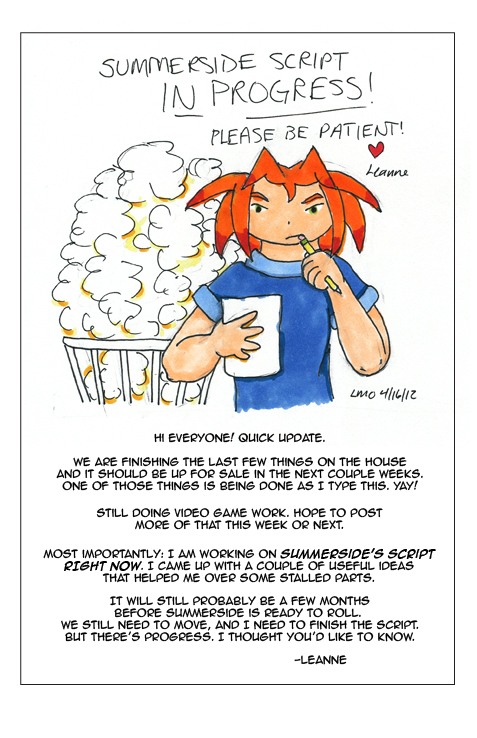 We are finishing the last few things on the house, and it should be up for sale in the next couple weeks. One of those things is being done as I type this. Yay! Still doing video game work. Hope to post more of that this week or next. Most importantly: I am working on Summerside's script right now. I came up with a couple of useful ideas that helped me over some stalled parts. It will still probably be a few months before Summerside is ready to roll. We still need to move, and I need to finish the script. But there's progress. I thought you'd like to know.